Where in the world is Dr. Randall Kyes? Friends, colleagues and students call him Randy. Ask any of them and they will tell you that Randy is always on the move. Dealing with the hustle and bustle of crowded airport terminals in far-flung corners of the world is just another day at “the office” for Kyes. Treacherous foreign tuk-tuk rides come with the territory for this nomadic primatologist and University of Washington Psych professor. Kyes, also a Core Staff scientist at the Washington National Primate Research Center (WaNPRC), and Director of the Center for Global Field Study (CGFS), spends much of his time away from his home in Seattle. Stretching every dollar of his modest grant money, he often sleeps in cockroach-infested motels or in tents stationed out in the bush. Depending upon the time of year, you might find him in Indonesia, Nepal, or Thailand. These are only a few of the countries that Kyes has added over time to his expanding portfolio of international collaboration. 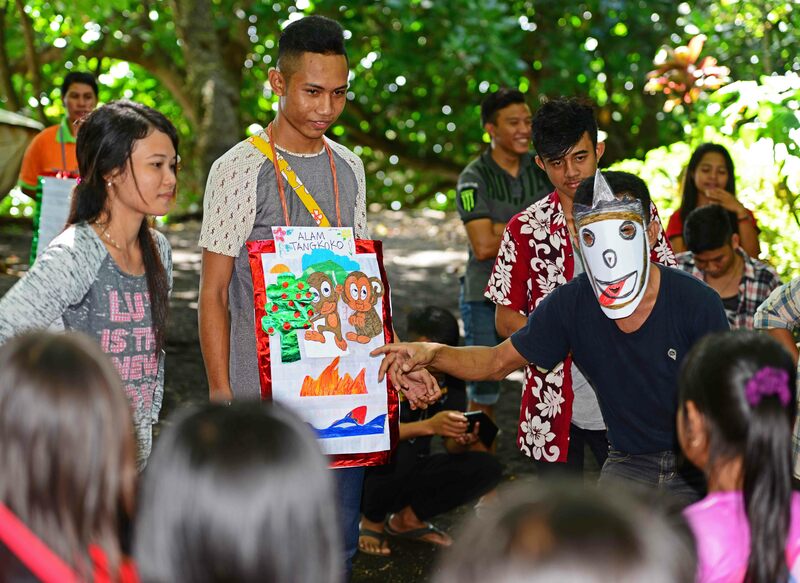 Since its infancy in 1990, beginning on Tinjil Island in Indonesia, three themes have emerged as driving forces for Randy’s global programs: Science, Collaboration and Community. Year after year, his colleagues and students personify those themes – as they work together on research projects addressing primate conservation and related human health, conduct field-training courses, and provide community outreach education – which may explain the longevity and success. This year marks a significant milestone in Kyes’ international collaboration – the 20th anniversary Field Course in Conservation Biology & Global Health at the Tangkoko Nature Reserve in North Sulawesi, Indonesia. Kyes, along with his Indonesian colleagues at Sam Ratulangi University (UNSRAT) and the Primate Research Center at Bogor Agricultural University (PSSP-IPB) recently completed their 20th annual Field Course for local university students, park rangers, and local tourist guides in the reserve. 20th Anniversary Field Course at the Tangkoko Nature Reserve. (Back row, from left) Dr. Kyes and colleagues Dr. Entang Iskandar (PSSP-IPB), and (back row, far right) Dr. Indyah Wahyuni and Dr. Meis Nangoy (Faculty of Animal Sciences, UNSRAT). The field course consists of daily lectures that focus on the human-environment interface and the relationships among environmental, animal and human health. Participants also engage in field exercises obtaining “hands-on” experience with the basic techniques and technology of field observation and data collection. The final phase of the course comprises only 20% of the grade but may have the most significant impact. 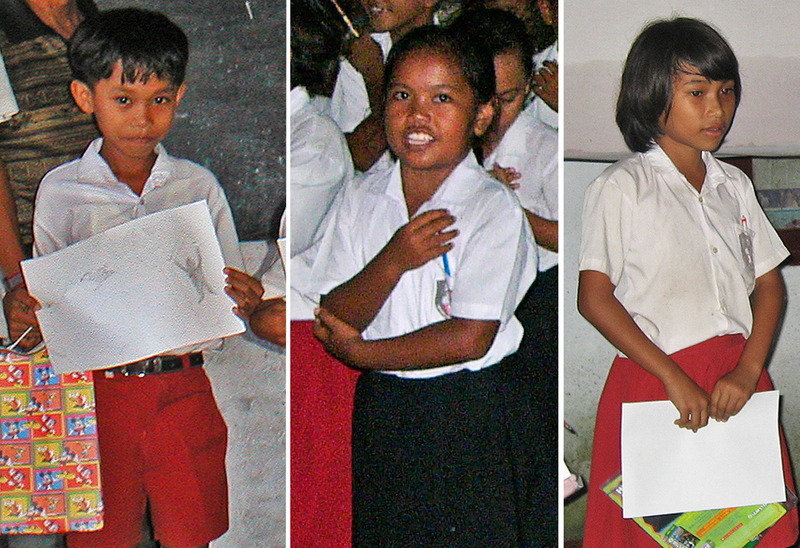 This component involves community outreach education, referred to as “Penyuluhan” in Indonesian. Field course participants are responsible for hosting an outreach program for local schoolchildren from the villages that surround the Nature Reserve. The theme also focuses on the human-environment interface and includes presentations and an art contest. This outreach program aims to educate a younger generation about the importance of conserving primates, other wildlife and their habitat. Outreach programs such as this have proven to be successful in promoting environmental awareness and its relationship with the global health of human populations. It also promotes a sense of commitment to conserving biodiversity in places like Tangkoko. (Above): Field course participants presenting information to local schoolchildren. 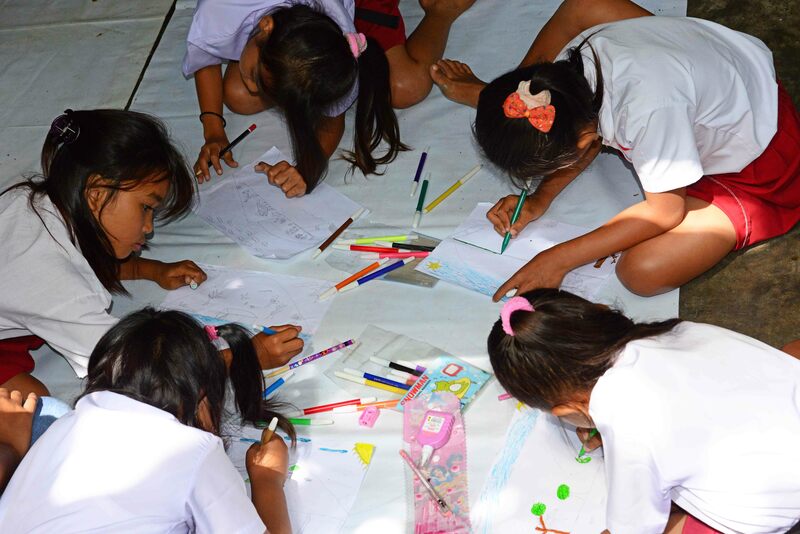 (Below): Elementary school students working on their drawings as part of an art contest focusing on conservation and global health. The proof of Penyuluhan’s impact has been particularly evident to Kyes since 2010. During the field course that year, two of the participants, young women from a local conservation organization, approached Kyes following his lecture on community outreach education, and said, “We remember the outreach program you did for us when we were in elementary school.” As it turned out, these two young adults had been third graders in the local village (Batu Putih) and attended the very first outreach program that Kyes and has colleagues did in 2001. Since that 2010 field course, Kyes has encountered an increasing number of field course participants who had previously attended the outreach programs as elementary schoolchildren. The 20th anniversary iteration this past May was no exception. Ardy, Mauren and Jelli, all from Batu Putih, all remember Kyes and his contingent visiting their elementary school when they were third graders over a decade ago. “These three young adults really personify the next generation of conservation leaders. It is truly energizing to see our “kids” grow up and seek out further training so they can help with the environmental and health issues in their region. It’s amazing to see this full circle evolving,” says Kyes. 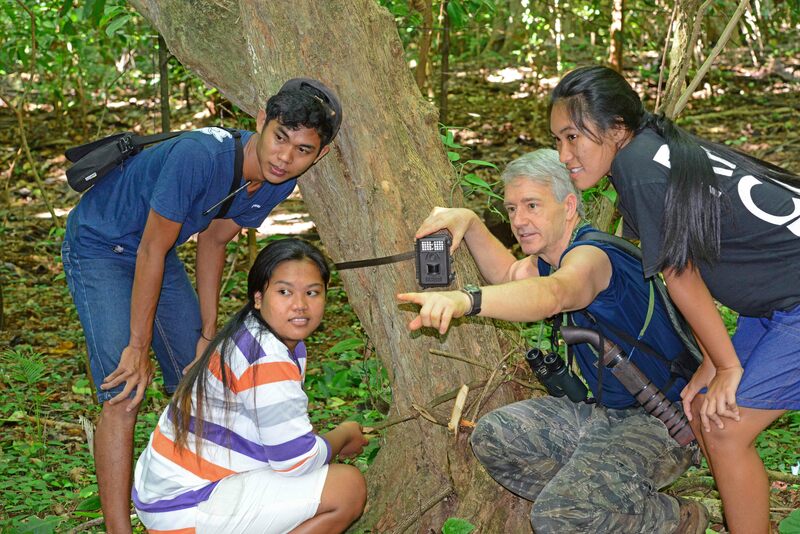 “Conservation Leaders of Tomorrow Remember Yesterday.” (Above): 2017 Field course participants Ardy, Mauren and Jelli (from left) learn about camera trapping techniques during a field exercise with Dr. Kyes (pointing). Below: Ardy, Mauren and Jelli as 3rd graders during the 2006 & 07 outreach education programs. The long-term international partnership in Tangkoko all began when Kyes made his first visit to the reserve in 1996. The following year, he and Dr. Entang Iskandar began preliminary population surveys of the critically endangered Sulawesi black macaque (Macaca nigra), also known as the Celebes crested macaque, once a nonhuman primate model for type 2 diabetes making it very valuable in scientific research. 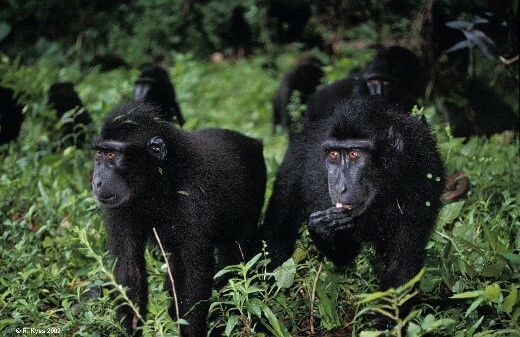 Like so many other primate species, the M. nigra has suffered the effects of hunting and habitat loss. A Wall Street Journal article entitled, “Taste of Death: Desperate Indonesians Devour Country’s Trove of Endangered Species” written by Peter Waldman in 1998 explored the topic in depth. An economic downturn as well as cultural practices that involved hunting and eating wild animals were contributing to an alarming decline in Tangkoko’s biodiversity. In recent years, however, there is increasing indication that the Tangkoko field course and outreach, as well as other programs like it, may actually be discouraging this practice. “1999 was our first official year of systematic population sampling and it indicated further decline from past studies. Over the years since, we have been doing the annual field course and this population survey and we’ve observed an encouraging trend. The population has not continued to decline (at least in our core study area), but rather it seems to have stabilized.” Kyes cautions however, that the population is by no means safe and views it at a tipping point. Without continuous conservation efforts, the future of this population remains at risk. Kyes and his colleagues published their findings in the January 2013 issue of the American Journal of Primatology. The survey is still ongoing and continues to be one of the longest of the M. nigra species. They plan to do a follow-up to this publication in a couple more years, once they reach their dataset of 20 years. “It is possible that our long-term activities like the outreach and field training could be having a positive effect, helping to promote an appreciation for conservation of the monkeys among the local people around the reserve who traditionally might be hunting the monkeys for use in holiday festivals or even for sale,” says Kyes. He readily admits however that he has no empirical data to support that assumption. Supported in part by: Faculty of Animal Sciences, Sam Ratulangi Univ. ; Primate Research Center-Bogor Agricultural Univ. ; Washington National Primate Research Center, UW; Center for Global Field Study, UW; One Earth Institute; Woodland Park Zoo; American Society of Primatologists; International Primatological Society; Southeast Asia Center of the Henry M. Jackson School of International Studies, UW; ORIP-NIH Grant No. P51OD010425 to WaNPRC.